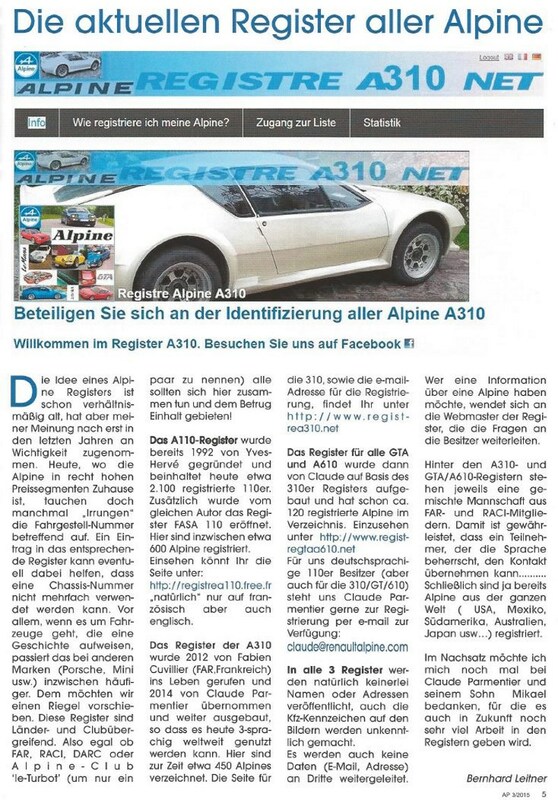 This site intended only to identifying and compiling the Alpine GTA and A610 that you own or owned to make an inventory of survivors of this exciting car. 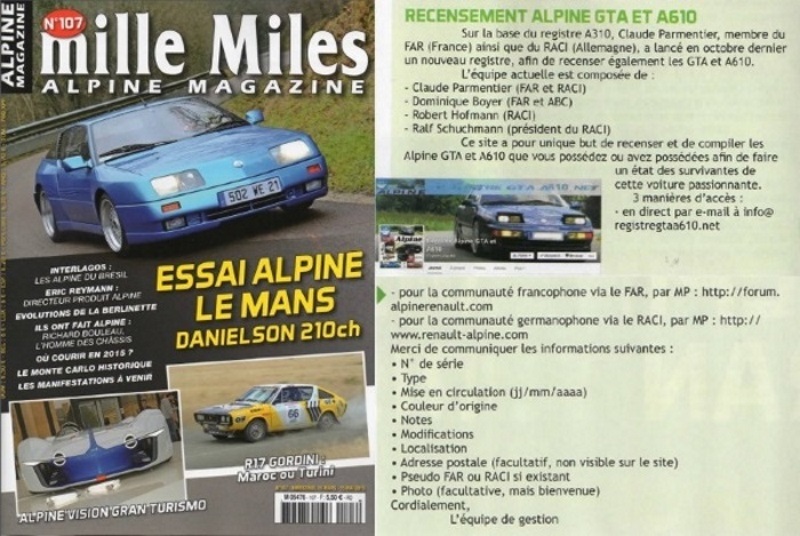 For further head to the FAR http://forum.alpinerenault.com or to the RACI http://www.renault-alpine.com/ two guiding lights for the Alpinists. 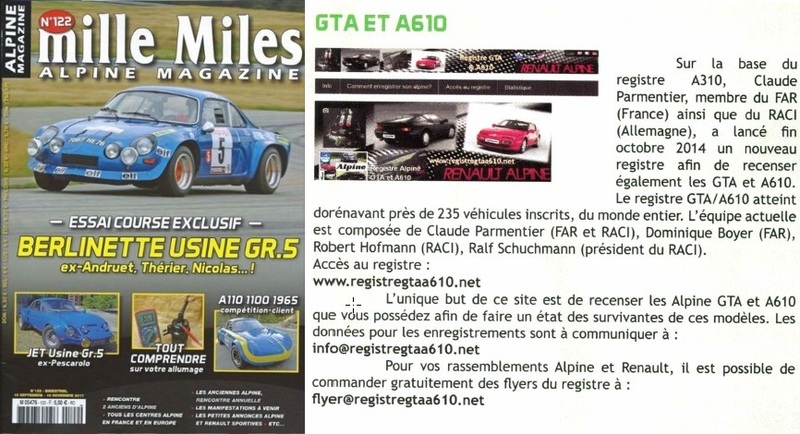 Flyers: If you are planning a Alpine event, and want to distribute flyers for the GTA/A610 register (or A310), write to us: flyer@registregtaa610.net specifying the desired number, postal address and date of the event. We will send the flyers for free. The car informations given in the list only commits the person who sends them to us. Serial numbers GTA D500 Synthesis assay serial numbers for the GTA and A610. If for the D500 it is quite clear, by the other models we have no many informations. Who can contribute? 1985 F0000013 a F0000600 30001 à ? 40001 à ? 1986 10001 a 10099 30??? à ? 40??? à ? 1987 10100 a 10213 30??? à ? 40??? à ? 1988 10214 a 10299 30??? à ? 40??? à ? 1989 10300 a 10373 30??? à ? 40??? à ? 1990 11000 a ? 30??? à ? 40??? à ? 1986 20064 a 20598 35001 a 35??? 60001 a 6???? 42001 a 42??? 1987 20599 a 21208 35??? a 35??? 6???? a 6???? 42??? a 42??? 1988 21209 a 21815 35??? a 35??? 6???? a 6???? 42??? a 42??? 1989 21900 a 22510 35??? a 35??? 6???? a 6???? 42??? a 42??? 1990 23000 a ? 35??? a 35??? 6???? a 6???? 42??? a 42??? 1989 3???? a 3???? 36001 a 36??? 65001 a 65???? 1990 3???? a 3???? 36??? a 36??? 65001 a 65???? ????? 67??? and 70??? ?????? 1991 70??? a 70??? 81000 a 81??? 1991 85000 a 85??? 85000 a 86??? 1992 85000 a 85??? 85??? a 86??? 1993 85??? a 85??? 85??? a 86??? 1994 85??? a 86??? 85??? a 86??? 1995 86??? a 86??? 86??? a 86??? 063 Gris / Gray / Grau ∎ ∎ ?